Arsenal returned to the top four of the Premier League with victory over Watford. 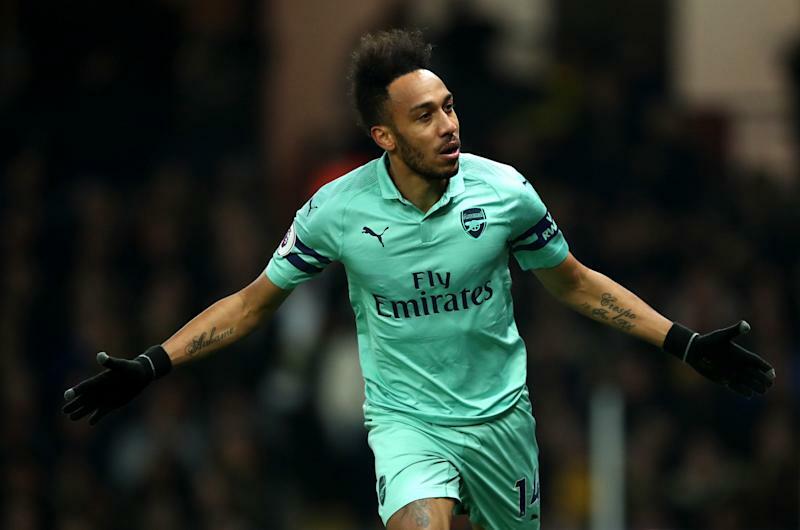 In an entertaining game at Vicarage Road the Gunners took the lead through Pierre-Emerick Aubameyang after a Ben Foster error, and Watford captain Troy Deeney was sent off all within the first 12 minutes of the match. Unai Emery’s side knew that Chelsea’s defeat to Liverpool on Sunday afternoon at Anfield meant that they had the opportunity to return to the Champions League places, and that is exactly what they did in a game they certainly didn’t have all their own way. The 10 men of Watford created plenty of chances throughout, and were unlucky not to take anything from the game. It was a lively start to the match with the Hornets seeing plenty of the ball in the opening exchanges. But it was Arsenal who took the lead in fortunate circumstances. Foster took an age to clear a back pass and the Gunners’ striker Pierre-Emerick Aubameyang was quick to close down the 36 year old’s clearance which rebounded off the Gabon international and into the back of the net for the opening goal of the game after only 10 minutes. An embarrassing moment for Foster, and just two minutes later it got even worse for the home side. Watford captain Troy Deeney catching Lucas Torreira with a late arm in the Uruguayan’s face, and much to Deeney’s disbelief, he was shown a red card. Watford a man down and a goal down with 78 minutes left to play. Troy Deeney of Watford leaves the field after being shown a red card for elbowing Lucas Torreira. Javi Gracia would have been pleased with the energy and commitment his side had shown in the game despite the scoreline and they were almost level on 20 minutes. Craig Cathcart with a snapshot at the near-post, but it was beaten away by Arsenal keeper Bernd Leno. Watford were clearly on top and seemingly unaffected by the early set backs to their chances of victory. Andre Gray was certainly in the thick of things and could have had a penalty midway through the first half. Leno felt that the Watford striker was in his way, pushing over the former Burnley man as a corner was whipped into the Arsenal penalty box, but referee Craig Pawson waved away the protest- although they were mainly from the raucous Vicarage Road crowd. 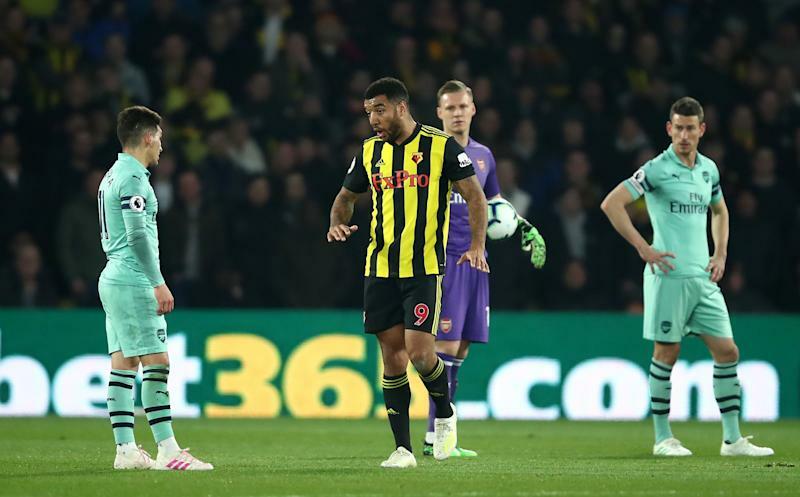 Etienne Capoue came closest to finding an equaliser for the Hornets, his free-kick was heading for the corner but it was a good height for Leno who strongly beat the ball away. Arsenal controlled the game until half time without threatening the Watford goal. 1-0 the score at the break. The start of the second period was a complete contrast to the start of the first half with Arsenal dominating possession with a slow tempo and methodical build up. 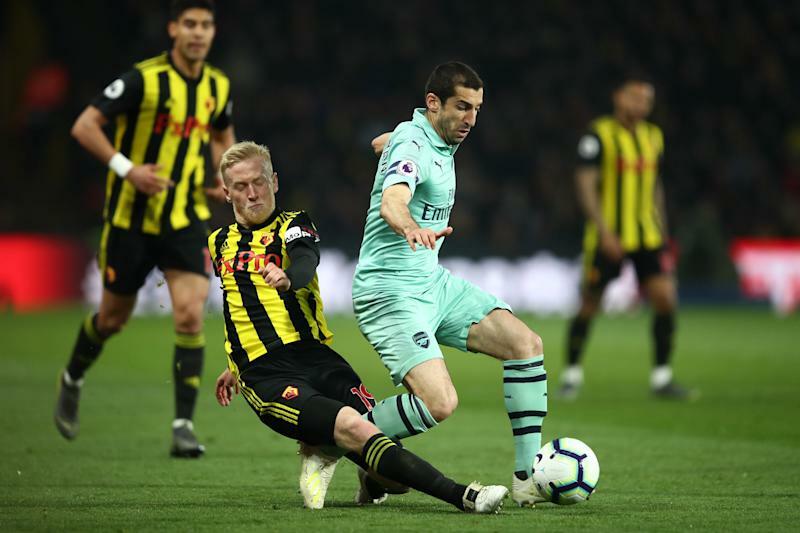 Henrikh Mkhitaryan of Arsenal is tackled by Will Hughes. The game began to heat up once more, the dangerous Iwobi standing the ball up to the back post, but the unmarked Henrik Mkhitaryan could only fire at Foster from close range as Arsenal broke and attempted to make the most of their one man advantage. The Arsenal man then had a couple more chances, but fired wide and then over. Mkhitaryan and Arsenal were almost made to pay for their missed chances when 25 year old Adam Masina struck a fierce effort from 25 yards out, but it could only clip the crossbar. With 10 minutes remaining Watford threw everything they had at the Arsenal backline. Andre Grey managed to get through on goal, rounded the onrushing Leno, but he was denied by the diving challenge of Ainsley Maitland-Niles. That was as close as a tiring Watford came, and Arsenal held on for the crucial three points. What does the victory mean for Arsenal and Watford? Arsenal move up to fourth spot in the Premier League with five games left to play. They take on Napoli on Thursday in the Europa League and then Crystal Palace at home on Sunday. Watford stay 10th and have a game in hand over Everton a place above them. A win away at Huddersfield on Saturday could move the Hornets as high as 7th.